Greg Berlanti has done it again. The executive producer behind CW's hit shows based on comic book characters like Arrow and The Flash is bringing Superman's equally powerful cousin to CBS with Supergirl. The one-hour drama stars Melissa Benoist as Kara Zor-El, who as a child landed on earth escaping the destruction of her planet Krypton, and was taken in by the Danvers played by Helen Slater (1984's film version of Supergirl) and Dean Cain (Superman from TV's Lois & Clark). After growing up being told to hide her powers, at age 24 she decides to embrace them and help people. Berlanti, along with executive producers Sarah Schechter (The Flash) and Ali Adler (Chuck). Berlanti and Adler joined Andrew Kreisberg (Arrow, The Flash) to co-write the TV pilot. CBS, known more for The Big Bang Theory and countless of police procedurals, is taking the plunge into the modern comic book adaption era in television. Something Berlanti is an expert in. Already having orchestrated the development of two for CW with another spin-off on the way, Berlanti could help the already #1 broadcast network (and parent company of The CW Network) reach the much sought-after younger demos. The cast includes Laura Benanti (Nashville) as Kara’s biological mother, Alura Zor-El, Calista Flockhart (Ally McBeal) as Cat Grant, the head of CatCo and Kara’s boss, Mehcad Brooks (Necessary Roughness) as Jimmy Olsen, a photographer for CatCo and Kara's love interest, and Owain Yoman (The Mentalist) as the super-villain Vartox. Berlanti has mentioned that Supergirl exists withing the same universe as his CW shows so in theory she could crossover and possibly visit Ollie in Starling City or Barry in Central City and vice versa. What's not known is how keen the CBS suits are willing to share their very expensive property with a sister company. They may realize when it comes to ratings, crossover episodes see a significant boost that could benefit CBS in the end. 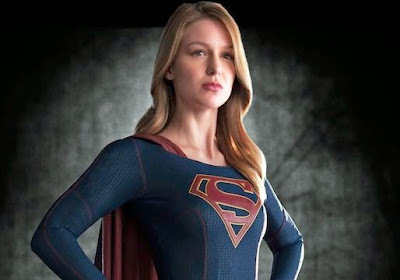 Supergirl will be on the CBS roster for the 2015-2016 Fall season.